Once, I knew the way back. A silk thread – such a fragile tether – spooled out behind. 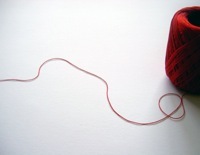 But when we reached the heart of things, the thread snapped, severed by knowing: he proved untrue. This post was written in response to the Trifecta Writing Challenge weekend prompt: This weekend’s challenge is to write a story entitled ‘Lost’ in exactly 33 words. The word ‘lost’ can only appear in the title, not your 33 words. This entry was posted in Microstories, Writing and tagged 33 words, microfiction, microstories, trifecta, trifextra. Bookmark the permalink. Wow, thank you! That’s a real compliment, coming from you. I’m looking forward to reading yours – I think you’re a great writer. I’m just starting on reading through all the Trifextra entries right now – I wanted to hold off till I wrote my own. A really lovely take on the 33 words. Thank you for sharing. I almost can’t stand how good this is. Brilliant writing. Nice. Heartbreaking. I really enjoyed this one! And so ends a loving relationship. It seems to me that we always start out with many threads, and it is the snap of that last one we remember most vividly. Beautiful story in so few words. Love it! Poor Orpheus! I know I already commented, but I came to say I wish we could chat about our entries this weekend. I went with thread as an image as well. I really wanted to talk about how my many moves had made it difficult to keep then”ties that bind” intact. But 33 words proved only enough to hint around at it. Orpheus – that’s close. I was actually going for a different myth. 🙂 Personally I love these short pieces *because* of the hinting around. I like that there’s usually something left to the reader to guess at, or infer. Seems perfect to me! If I were a judge, you would certainly “place or show,” if not win! I so appreciate your visit to my site as well. I am looking forward to participating in these challenges. This was my first one! Heartbreaking story told in so few words yet written so lovely… kudos! Beautiful. Really lovely response to the prompt. I love that image of the thread ‘spooled out behind’. Thanks for linking up and see you for the weekday challenge hopefully.